Fall is here and you know what that means, great sports!!!! 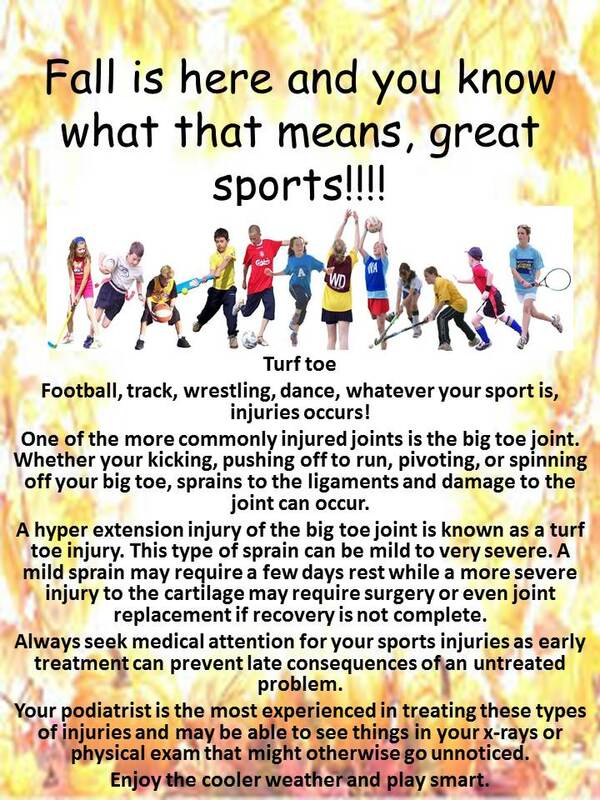 Football, track, wrestling, dance, whatever your sport is, injuries occurs! One of the more commonly injured joints is the big toe joint. Whether your kicking, pushing off to run, pivoting, or spinning off your big toe, sprains to the ligaments and damage to the joint can occur. A hyper extension injury of the big toe joint is known as a turf toe injury. This type of sprain can be mild to very severe. A mild sprain may require a few days rest while a more severe injury to the cartilage may require surgery or even joint replacement if recovery is not complete. Always seek medical attention for your sports injuries as early treatment can prevent late consequences of an untreated problem. Your podiatrist is the most experienced in treating these types of injuries and may be able to see things in your x-rays or physical exam that might otherwise go unnoticed. Enjoy the cooler weather and play smart.